Finland has 1,100 km of coastline and a glorious archipelago, the largest in the world in numbers of islands. Here you will find some of the most rewarding spots for sea trout, pike, perch and pike-perch. In summer, pike and perch are fished by spinning from boats or the shore. Jigging for perch can also result in a handsome catch, and pike-perch is trolled from boats in mid-summer. Ice fishing for perch, pike and burbot is also possible on the sea in deepest winter. Ice fishing for burbot is a very special kind of ice fishing because it takes place in the dark night January-February! Many types of whitefish are found in Finland, all described by the same scientific name Coregonus lavaretus S.L. Whitefish can be found in most lakes and many rivers throughout the country. Whitefish require cool water that is rich in oxygen. The diet depends on the type of whitefish. Those with fewer teeth are specialised in aquatic insects, whereas those with denser teeth feed on organic plankton. Whitefish spawn in the autumn during September-October when the water cools to a temperature of 2-5°C. Whitefish are most often caught with nets, but they can also be caught with other gear such as small wobblers, lure, jigs and flies. The greatest chance to catch a whitefish is during the autumn. Most whitefish caught weigh 0.3-1.5 kg, but specimens of over 5 kg can be found. The largest whitefish caught in Finnish waters is 7.1 kg. In Finland trout are found throughout the country. Trout are separated into three ecological species, according to their behaviour. Sea trout live in the sea and brown trout in lakes, but they both migrate up the rivers to spawn in the autumn. In rivers, trout feed on aquatic macroinvertebrates, insects and small fish. At sea and in their lake stages, fish is their most important diet. In the sea, the most important food sources are Baltic herring and stickleback; in lakes they are vendace, smelt and nine-spined stickleback. But there are also brown trout that have not adopted this pattern of behaviour. They live throughout their lives in small rivers or brooks and feed on insects, basic life forms, and even crustaceans. Brown trout, living in the smallest creeks and ponds in Lapland, is called "purotaimen". Trout are caught by recreational fishermen with lures and flies. The greatest chance to catch a trout on a rod is during the spring and autumn. Additional information from fishing areas. Most trout caught weigh under 5 kilos. The largest trout caught in Finnish waters is 12.4 kg. Arctic char is a very beautiful fish: light coloured spots on a dark background in sides. They are variable in colour depending on the environmental conditions of the lake they live in and the time of year. As the char approaches spawning, the spots, belly, and fins take on a bright orange, red, or gold cast, and the lower fins have brilliant white leading edges. The entire body may become golden or orange. Spawning colours are more exaggerated in males than in females. They Spawn in autumn, when the water cools to a temperature of 3-6°C. Arctic char need clean and cool water. They are found in lakes in Lapland and the water system at Vuoksi. The young eat aquatic macroinvertebrates and insects, when older they consume fish. The diet, growth and maximum size may vary greatly, depending on the productivity of the particular lake and the presence of other fish species. The greatest chance to catch a char on a rod is during the spring and the autumn. 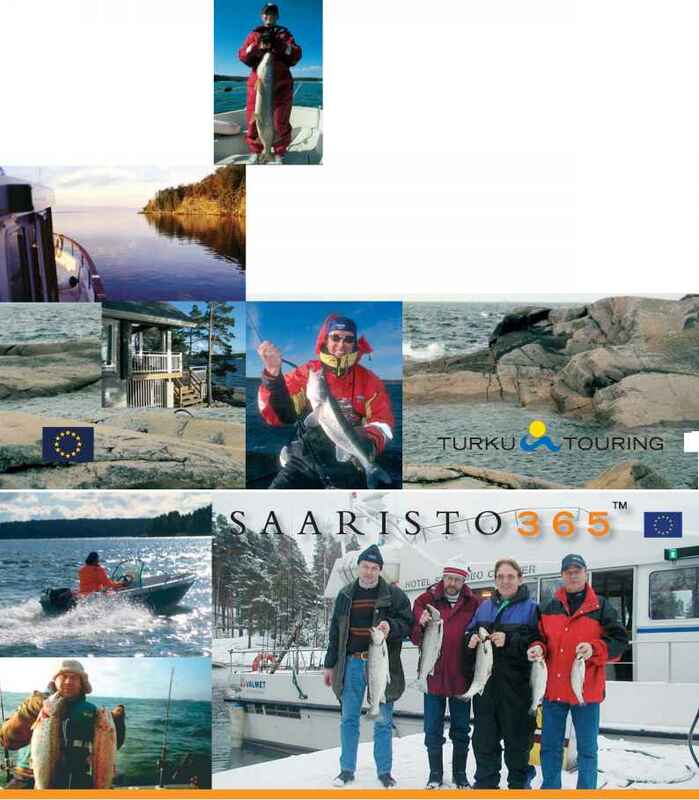 The best season for ice fishing is April-May in Lapland. Please find Additional information in fishing areas section. Most arctic char caught weigh between 0.3-5 kg. The largest arctic char caught in Finnish waters is 6.4 kg. Native to North America, the rainbow trout is not found naturally in Finland, although it is released into many fish management waters. The typical release size is 35-55 cm. Rainbow trout grow quickly and can be easily farmed. This makes them ideal for put and take fishing locations. Despite its competitive nature, some fishing water owners also release it into salmonid waters and flowing waters. However, the numbers of rainbow trout used for restocking are in decline. Steelhead trout have been put in some waters on an experimental basis. When caught, the rainbow trout can put up a good struggle. It is a very choosy and challenging fish for sports fishers. Rainbow trout thrive in many different types and qualities of water and can be found throughout Finland except in the very far north. The largest rainbow trout caught in Finnish waters is 7.1 kg. What other fish are found in Finland except for perch and pike ?